Clark the Carver of Carve Me A Bear! Chainsaw Carvings has been applying his skills for 30 years and creating enchanting pieces of chainsaw carving artwork. Clark sells his unique carvings out of Las Vegas, Nevada but escapes the desert heat and seeks refuge in Helena, Montana during the summer. Clark the Carver of Carve Me A Bear! 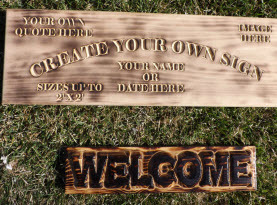 Chainsaw Carvings takes custom orders as well as having a multitude of collectibles to choose from. 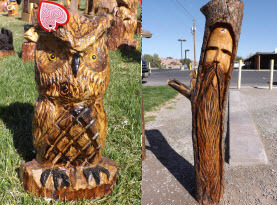 From a mass array of animals, tikis and totems, to welcome or custom name signs, to mountain men, furniture and memorial planters, he even can turn that eyesore stump and turn into something magical. Among the many things Clark the Carver of Carve Me A Bear! Chainsaw Carvings can create for his valued customers, is furnishings carved with his trusty chainsaw. Bar stools, chairs, benches, end tables, lamp bases or the base of a glass-top table, Clark can create amazing furniture for your deck or yard, or even inside your home. With your custom ideas, or allowing Clark the Carver’s creative juices to flow; your lawn or indoor furniture will truly be unique and one of kind. Clark the Carver of Carve Me A Bear! 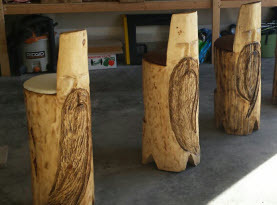 Chainsaw Carvings bar stool chairs can make any indoor or outdoor mini bar stand out. Having a tiki-bar theme can be easily carved into matching bar stools. Specializing in tiki or totem poles, your bar stools can fit right into place. Perhaps you favor a specific animal, or sports teams, your monogram can all be carved into the individual bar stools of your choice of quantity desired. With your custom bar stools at your next party, you can serve your guests in comfort and style! Clark the Carver of Carve Me A Bear! Chainsaw Carvings has custom designed beautiful benches, ideal for the outdoor enthusiasts. 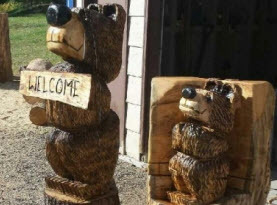 Completed with bears on either side, or a miniature totem replica, any preferred animal, sports theme, or even something simple yet rustic can be carved to create your bench. Propping in next to the home to watch the kids play, or underneath your favorite tree, or even adorning a subtle outdoor fish pond perfect for a small retreat, your costumed carve bench from Clark the Carver of Carve Me A Bear Chainsaw Carvings can be just the thing to make your landscape perfect! There are many bases that strategically hold up a glass top or even a wooden top if that is your tastes, but too many times all we can find is that generic hunk of wood, maybe displayed into a shelf fitted with the glass top to make your coffee table for example. But what if you are partial to horses, or chickens, or man’s best friend in the form of your favorite breed, or a tribute to your beloved pet? Well, Clark the Carver of Carve Me A Bear! Chainsaw Carvings can create a custom and unique base to hold your glass top, and with your design, we can carve something more fitting to your design. If you have some furniture that has grabbed your attention call Carve Me A Bear! Chainsaw Carvings today, we can consult with you on the possibilities!